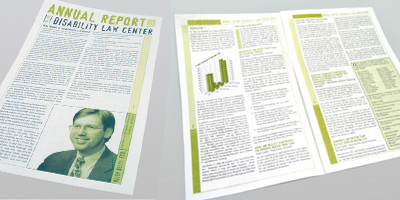 Role > Designed Annual Report / newsletter template which was later applied to all successive Newsletters and Annual Reports, performed all prepress and production. Objective > The purpose is to raise awareness of the non-profit organization Disability Law Center, which defends the rights of the physically and mentally disabled. It is sent out to all who donate, and are involved with the ACLU and DLC. Results > This newsletter is functional and informative low-cost alternative for a Charity such as the Disability Law Center. The project was a great success for this non-profit.